As an IT service provider, one of the greatest joys that we can experience is that of recovering a client from the brink of disaster by having had a good backup and restore system in place. Conversely, it is a very awkward conversation for us to have with a business owner, when disaster recovery is needed and failure, miss management or non existence of a suitable backup has occurred. Over recent years the amount of data that businesses store and find vital to their business operations has exploded exponentially. In light of the recent EU GDPR rules, Australia’s data breach laws it now behoves the business owner to take a “duty of care” over the safe storage of data, whether it be on-premise, in the cloud or a mixture of both. In the case of a Cyber-Attack such as Ransomware, recovery from backup is mostly your only way of solving the situation. Some common backup failures we see. What is the cost of a proper Backup for Business? As a general rule, costs are directly related to the speed at which you can be restored after a loss, and the subsequent amount of data that you may need to manually re enter. At the lower end of the scale we see the average costs at around a dollar a day for the small user, and at the higher end maybe around ten dollars. Your mileage may vary, but you might figure that if your business is not worth a dollar a day then it is probably high time to reconsider its very existence and future. My data is in the cloud – why do I need to backup? A lot of businesses (quite rightly) use services such as Office 365, Onedrive, Drop Box. Google Drive, Box etc. In the most, these services are a sync service and not a true data storage service with retention policies and a secondary backup. Example: Office 365 is a great product and makes it easy for employees to collaborate on documents and projects at the same time and across any device. Unfortunately this environment also makes it easy for the two thirds “human error” (mentioned earlier), to kick in, and for files or folders to be accidentally deleted. Given the high cost of downtime these days, it is far more economical to go to your secondary backup, than to do battle with the difficult and limited support options provided by these large corporates. If your retention parameters are set right you may even be able to recover from your secondary backup a deletion from a year (or more) ago rather than the default seven or fourteen days that some of these large providers only have the ability to roll back. What is the best backup system and software to use for my business? After the authors twenty years in this business he has seen many changes in this space. The best system is one that is properly managed by your IT service provider (or IT department if you have one). Why? A trained IT person getting daily status reports about your backups absolutely trumps the old fashioned way of Doris remembering to take the backup each night and then take a copy home. 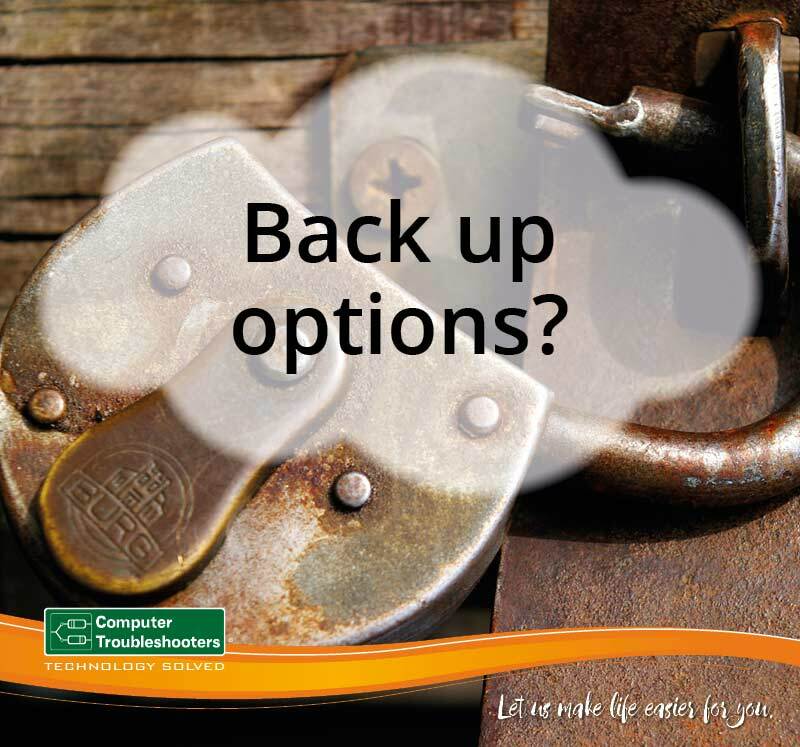 With managed backups, problems can be attended to immediately, backups can be periodically tested for integrity etc. etc. Names like Acronis, Backblaze, Cloudberry, Datto, StorageCraft, and Veeam are popular amongst IT professionals. Although they all have strengths and weaknesses in particular situations, they all tend to do much the same thing on a a features vs. price basis. A little like the Holden vs. Ford argument. Your local Computer Troubleshooter is well equipped to advise here as they will know which product best compliments your businesses needs and their client monitoring and management system.